The myth of multi-tasking (and how this school year can be different). Research shows that nearly half of teens admit to watching television or using social media while completing their homework, and most believe that media multitasking has no effect on the quality of their work. Two-thirds of those who media multitask while completing work don’t believe watching television or texting has any impact on the quality of their work, and over half say using social media has a negligible impact on the quality of their work. As someone who has worked with thousands of sleep-deprived, stressed-out, anxious tweens and teens, I beg to differ. In the middle of completing math homework, you notice a phone notification because you have a text message from someone— who could it be? Maybe a friend, or perhaps a romantic interest. It could be a relative asking a quick question, or a teammate wanting to know when practice starts. Receiving a text message creates a sense of urgency, and the natural inclination is to answer the message. But then what happens? It’s not as if you then fully return to completing math problem #3 once the message is sent. (Students usually nod in agreement.) More likely, you sit and wait for a response, to which you might need to think up a funny, witty, and spontaneous reply. Thirteen messages later, you are still on math problem #3—and you’ve convinced yourself the past half-hour has been dutifully spent on math homework. If you are in your room, your parents likely think you are hard at work as well. Whenever I give this “math problem #3” example, nervous laughter erupts from the audience, because nearly all tweens and teens who message their friends experience a similar scenario on an ongoing basis. It’s no secret that students struggle with self-regulation, especially when it comes to understanding how to compartmentalize work so they can remain productive and focused. Some of this struggle is developmental and is affected by where tweens and teens are in terms of brain development. Boys’ brains are still developing until they are about twenty-four years old, and girls’ brains aren’t fully developed until they are around twenty-one years old.18 The prefrontal cortex, the area of the brain that regulates impulse control and sound decision-making, still has a good way to go for many tweens and teens, and the pleasure principle often reigns supreme. Various forms of media often provide an instant gratification and distraction that can be hard to overcome in the face of longer-term goals related to academic performance and overall wellness. When it comes to helping students with self-regulation, adults often make the mistake of coming from a place of punitive anger and frustration about distraction and off-task behaviors. In reality, adults have their own struggles regulating technology and social media use. Research suggests that adults check their smartphones an average of once every six minutes—or over 150 times per day. Some 93 percent of 18–29 year olds admit to using their smartphones to avoid being bored, and 57 percent of phone users report that their phone use leaves them feeling distracted. Today’s employers go to great lengths to try to manage employee productivity during the workday, blocking access to personal email or websites that might be distracting, hiring consultants to provide professional development around increasing mindfulness, and managing technological distractions so that work can be completed more efficiently. Given the issues adults in the workplace experience related to online distractions and productivity, we need to shift our perspective and understanding of self-regulation and create opportunities for students to develop their own intrinsic motivation to make behavioral changes. At the same time, we also need to provide students with concrete tools to make those changes. In my office, I regularly see students who want to be more organized and get their work completed in less time (and producing better quality work) but they don’t know how to get started. For those who are easily interrupted by the distractions that come with checking their phone, I recommend downloading the Forest app, which is acts as a timer for a user-specified period of time, say 25 or 30 minutes. If a user makes it through the designated time period without checking his or her phone, a digital tree in a forest is planted. The gamification of it all is enticing – and users can actually plant real trees with the credits they earn for staying off their phone. For those wanting something more simple, an easy Pomodoro timer app, which breaks work blocks into 25-minute time chunks will do. The key is to find easy and effective ways to encourage the shift from multi-tasking to mono-tasking. Doing so requires structure and strategies. Many of my students create a separate home screen for their work time, and they often use Self-Control (Mac) or Cold Turkey (PC) to block specific websites they find distracting (some block ESPN.com or gaming sites, others block online shopping). Freedom disables access to the internet, which can also be helpful trying to write an essay or are studying, but can be complicated when completing assignments requires internet access. It is important for students to identify and implement strategies that work for them to encourage increased focus for set blocks of time. My work is all about helping students recognize using strategies that improve focus and monotasking can give them an extra seven to ten hours of free time per week. Seven to ten hours? They are quickly sold – and realize that the switching back and forth, checking notifications, sending Snaps and commenting on IG photos, adds up to a whole lot of time. If they choose to do those things once they are done with math problem #3, that is all well and good. My ultimate goal: once work is completed well, students have more free time to play, rest, and relax – and can choose how to spend those precious minutes. 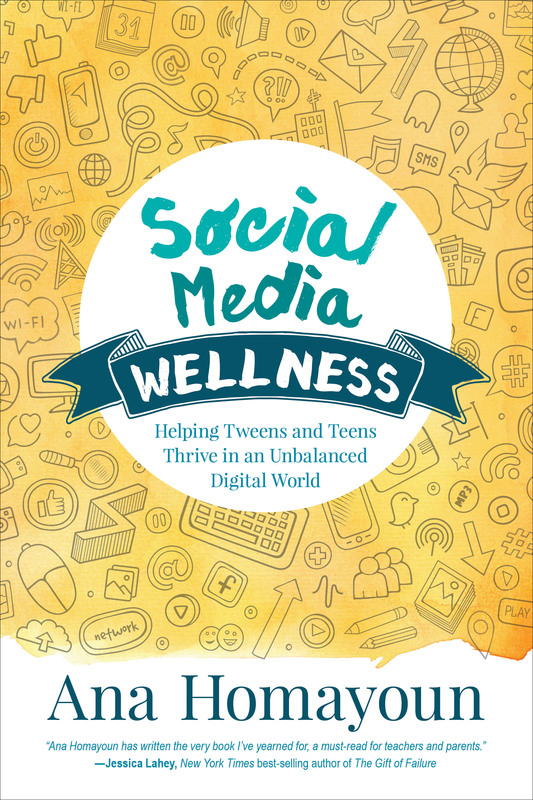 Ana Homayoun is an author, most recently, of the recently released book “Social Media Wellness: Helping Teens and Tweens Thrive in an Unbalanced Digital World.” This article is excerpted from the book. To learn more, visit www.anahomayoun.com or follow her online at www.twitter.com/anahomayoun.com.